With an early interest in health and physical fitness, the chiropractic profession was the perfect fit for Dr. Pray. He visited a friend in Chiropractic College, then met with other chiropractors and knew it was the right career. With a desire to help others and to be an entrepreneur, he enrolled at Life University in Marietta, Georgia to earn a Doctor of Chiropractic in 1993. Dr. Pray founded Pray Chiropractic in 1995, and since has been known for providing excellent natural health care. Dr. Pray is dedicated to cutting-edge solutions and is constantly researching and traveling the country to bring the best treatment options to his patients. In 2005, his was the first chiropractic office in the country to use digital X-rays and is constantly researching effective techniques and therapies that can further benefit his patients. Dr. Pray treats all ages in the Ringgold office and especially enjoys assisting those with difficult cases. 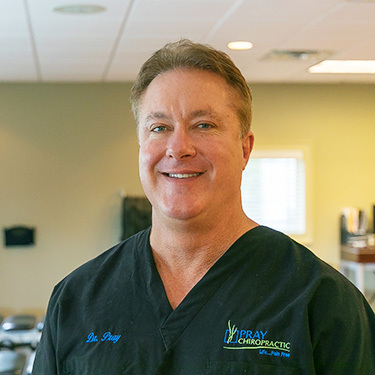 With specific adjusting techniques and leading technology like spinal decompression and laser therapy, Dr. Pray feels proud to have helped many people in the Dalton and Ringgold communities. Dr. Pray and his wife, Dawn, enjoy staying active by hiking, biking and being in the great outdoors. Dr. Pray likes to travel, spend time with his 4 children, and make the most of downtown living. Additionally, he is a member of the Georgia Chiropractic Association. If you’d like to schedule an appointment, contact our friendly, caring team today! We’re in-network providers with many insurance plans.